Raise your hand if ever in your life you have struggled with a recipe. My hand is waaaaaay up there (well, as high up as it can get when you’re only 5’1). Sometimes it’s cupcake batter that runneth over and spills all over the inside of the oven. Sometimes it’s a cake that ends up looking like the Leaning Tower of Pisa. Sometimes it’s an experiment gone terribly (and inedible-y) awry. Sometimes it’s trying to recreate a favorite treat from a restaurant or bakery and you just.can’t.get.it.right. These have all happened to me (some, many times over! 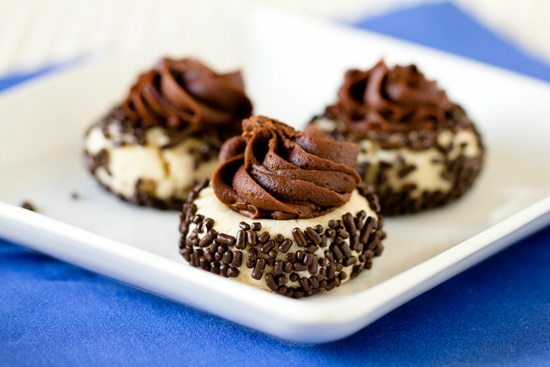 ), but today, I’m focusing on that last one – recreating a favorite treat. Here in Pittsburgh, Giant Eagle is our large supermarket chain, and their bakery sells the most addicting cookies ever – Chocolate Thumbprints with Sprinkles. 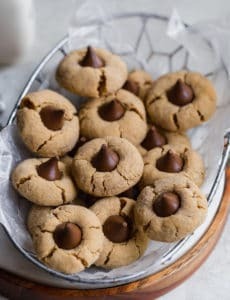 These are, without question, my Chief Culinary Consultant’s favorite store-bought cookie and he has done a fabulous job of getting me completely addicted to them. Approximately one out of every two times we wander into the grocery store, we wander out with a dozen of those cookies. Then, we promptly polish them off in less time than I care to admit. For the longest time, I have been trying to recreate those little devils, and I’ve finally got something close! The cookies from Giant Eagle are not crispy, but they’re not soft or chewy either; rather, they’re very tender. They crumble a little bit when you bite into them, but then they have some give. The cookie is only the first part of the equation; once we get past that part, it’s figuring out the frosting. To be quite honest, it tastes pretty much like chocolate frosting from a can, which normally I’m all “bleh” about, but oh my, on these cookies… I want to swim in it. Turns out, it’s pretty darn difficult to try to make frosting from scratch that tastes like frosting from a can. Shocking, right? I think that’s probably a good thing, but doesn’t make it any easier! I have gone through no less than four or five iterations of these cookies, two batches of which needed to be thrown out when experiments went awry! I’ve played with different ingredients, ratios, and mixing methods and have taken copious amounts of notes on pretty much every thumbprint recipe known to man. These babies are my pseudo-final (but-still-a-work-in-progress) version of the ever-famous Giant Eagle Chocolate Thumbprint Cookies. They are close, but I’m dying to get it as close to exact as possible. The recipe, of course, is a “Giant Eagle bakery secret” so I’m on my own! If I make any changes to the recipe below in the future, I’ll add a date and an edit note so you know what’s been changed. These easy chocolate cookies are ready to eat in 30 minutes! Preheat oven to 350 degrees F. Line two baking sheets with parchment paper. In a medium bowl, whisk together the flour and salt; set aside. Pour the chocolate sprinkles into a small bowl; set aside. 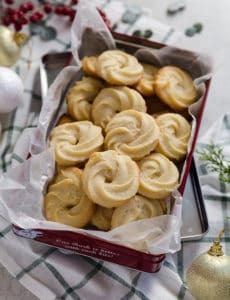 Using an electric mixer on medium-high speed, cream together the butter, powdered sugar and vanilla extract until light and fluffy, about 3 minutes. Reduce the mixer speed to low and add the flour mixture. Once it is mostly incorporated, slowly increase the speed back to medium-high and beat for another minute or so until a dough forms. 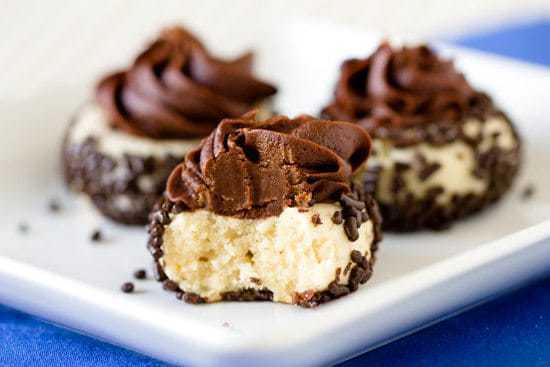 Scoop out a tablespoon of dough, roll it into a ball, and then roll it in the chocolate sprinkles and place it on the baking sheet. Repeat with the remaining dough, spacing your cookies about 1½ inches apart on the baking sheet. 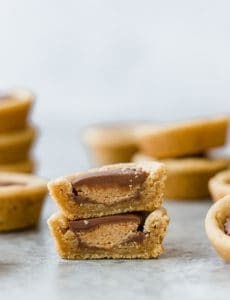 Make a slight indentation with your thumb (or the back of a melon baller - my favorite tool for this task) on the tops of all the cookies. Bake for 10 minutes, then make a deeper indentation in the middle, and bake for an additional 8 minutes. The cookies should not brown much at all around the edges. Transfer the cookies to a wire rack to cool completely. Meanwhile, make the chocolate icing for the filling. Beat the butter with an electric mixer on medium-high speed for 2 to 3 minutes, or until light and creamy. Reduce speed to low, add the powdered sugar and cocoa powder and mix until combined, then increase the speed to medium and beat until smooth. Add the milk and the vanilla extract and beat until light and fluffy. Add more powdered sugar or milk to achieve the desired consistency. Once the cookies are cool, pipe some frosting into the middle of each cookie (or you can spoon it in). Store leftovers in an airtight container at room temperature for up to 5 days. « Previous PostFree Food Friday! Giant Eagle Market District GIVEAWAY! I had to laugh about your description of these cookies. Giant Eagle is the grocery store I always shop at, however both locations I normally go to being the Waterfront Giant Eagle & the Kennywood Giant Eagle, I have never seen these cookies. Yesterday I was in Squirrel Hill and stopped at that Giant Eagle to pick up a few items and I seen these Thumbprint Chocolate Sprinkle cookies. 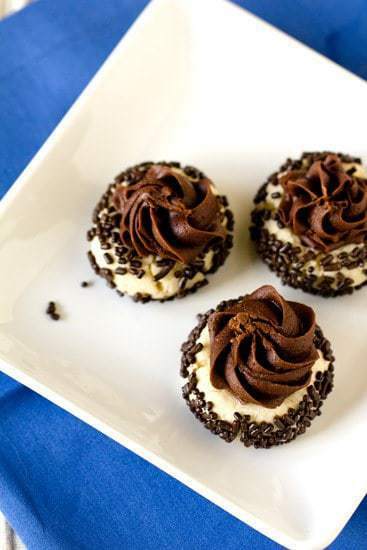 Anything chocolate with jimmies is something that’s definitely going into my cart! I’m on day 2 of polishing off the entire container of cookies. Your explanation of the cookie dough is spot on. I’m sure if you never had these the description will leave you a bit confused, but I knew exactly what you meant. I love baking so I immediately went online looking for this recipe. I was so excited when the pictures of your cookies popped up. There are no other cookies from my search that even look close to the Giant Eagle cookies. I’m so thankful you took so much time to try and duplicate their recipe. I’m going to try it over the weekend. Now how about figuring out the Whipped Cream Icing recipe that either Giant Eagle or Shop n Save use. It’s definitely not just heavy cream and powdered sugar or with vanilla. I don’t know what the ingredients are but I haven’t found a Whipped Cream recipe that even comes close. Thank you for the Thunbprint recipe! Cheers! !